This one has been a long time coming, but… I finally got around to creating a ‘roadmap’ of sorts for everything that we went through this past spring/summer as we prepared for our move, and then actually relocated. So… If you’re interested in learning more about what you can expect when moving, decisions that have to be made, etc., then look no further. And be sure to read the comments as well as the posts, as a lot of people pitched in with tips, tricks, and suggestions that ultimately made the process a lot easier for us. – Whatâ€™s a Piggyback Mortgage? – Cut Your Own Grass or Use a Lawn Service? – What Would You do With a Bunch of Bricks? 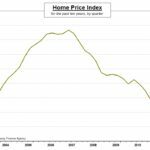 Home prices are up: good news or bad? When it comes to relocation, working with the right Realtor can make a big difference. Wherever you’re headed, check with the Real Estate Chamber of Commerce to find a top Realtor. Wow, great timing. My wife and I are relocating across the country in 16 days. Thanks for the roadmap!